Lafayette Connector Comments: A manufactured gas plant in Lafayette? And why Lafayette needs a drinking water protection program? A manufactured gas plant in Lafayette? And why Lafayette needs a drinking water protection program? You know the idiom "carrying coals to Newcastle." It refers to taking something to a place where it already exists in abundance. It seems that this would apply to manufacturing gas from coal and/or oil in Louisiana, so let me explain. By 1900, Lafayette's residents had both water and electricity as residential utilities. However, in the early 1920's there was still no natural gas pipeline carrying gas to Lafayette, and no residential or industrial gas utility available. To respond to this demand, the Louisiana Public Service Company built a manufactured gas plant and ran pipes to service Lafayette residences in 1926 (Griffin, 1959). The gas plant was located north of the railyard (Figure 1). In 1931, a natural gas pipeline reached Lafayette from Northern Louisiana, and operation of the manufactured gas plant was discontinued. 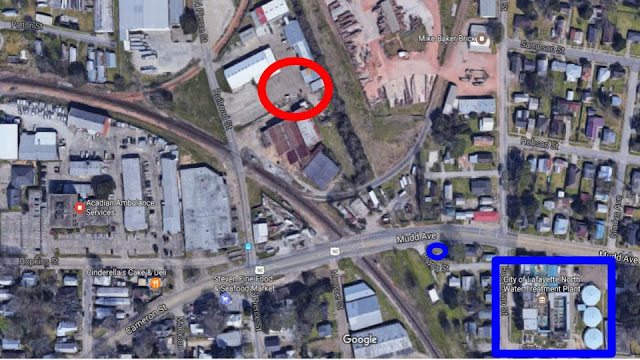 While this history is interesting, you may be wondering "how is a former manufactured gas plant site related to the I-49 Connector issues?" It is another likely source of contamination endangering the Chicot Aquifer which is designated as the sole-source of drinking water for Lafayette Parish. Before we design or construct this interstate over our water wells and sites of contamination we need to quantify the threat and plan how to deal with it for ourselves and our children. Figure 1. Louisiana Public Utilities Company gas plant as mapped in 1928 (clipped from 1928 Sanborn map of Lafayette, Louisiana from electronic copy available through the Lafayette Public Library). Figure 2. Contemporary view of the LPUC former gas plant location (red oval) mapped by Google Earth (saved on April 10, 2017). The LUS North Water Treatment Plant (blue rectangle) and LUS water well #16 (small blue oval) are also highlighted. The proximity of the FMGP site to our Lafayette drinking water wells (Figure 2) heightens the already existing concern over contamination of our Chicot Aquifer. Monitoring has already clearly established that surface contaminants are finding their way into our wells (Connector Comments, 2017a, and 2017b). In a letter proposing recommended actions to our local political leadership, the Acadiana Group of the Sierra Club and the WaterMark Alliance recommendation #10 was to draft and adopt ordinances based on LDEQ drinking water protection sample ordinances. The presence of yet another risk to our drinking water further demonstrates the need for a Lafayette drinking water protection plan, an ongoing program, and protective ordinances. The Chicot Aquifer beneath Lafayette is a plentiful source of water, but its quality can be compromised for present and future generations if we fail to protect it. Connector Comments (2017a). Y-49 takes a turn: Public meeting summary and video, January 19, 2017. published 1/29/2017. Connector Comments (2017b). Contamination of our Chicot Aquifer. What do we know? How do we know? What should be done? published 4/3/2017. Hathaway, Allen W. (2011). Remediation of Former Manufactured Gas Plants and Other Coal-Tar Sites. CRC Press, 1398 pages. Hathaway.net, (undated) Former Manufactured Gas Plants. accessed April 2017.